Stamp Overlays are typically applied at ¼" thick to add patterns and texture to existing concrete surfaces. The same look of regular stamped concrete can be achieved over existing concrete with a stamp overlay. This process works on both horizontal and vertical surfaces. More information on Stamped Concrete. Spray texture or knock down overlays create a non skid surface that looks good and is easy to apply. Because of this safety feature, this process is ideal for pool decks, patios, walkways, or wherever a non-skid decorative surface is desired. 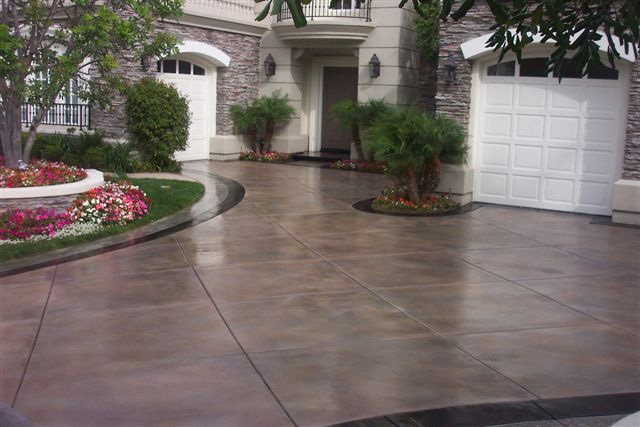 Spray texture can be applied alone or in combination with stencils to create beautiful concrete surfaces. Midwest Rake Company is dedicated to supporting the fast-growing decorative concrete industry with quality application and finishing tools. Contact Jobsite Supply for details. CS Unitec Mixers feature soft start and variable speeds which minimizes splashing when starting. The high-torque motors are designed with specialty gears to provide maximum power allowing you to mix quantities from 1 gallon to 200 lbs. Special paddles will mix from the bottom up, eliminating injection of air for an optimum blend. CS Unitec Mixers are versatile and ergonomically designed to ensure a balanced grip and reduce operator fatigue. The unique design protects the motor against damage when the mixer is laid flat. Mixers can be hand-held or used with portable mixing stands. Contact Jobsite Supply for details.